Our Lake Bracciano private tours include: Our Lake Bracciano private tours include private transportation, entrance tickets and guided tour of Orsini – Odescalchi Castle, service of driving guide, tolls, parking, taxes. 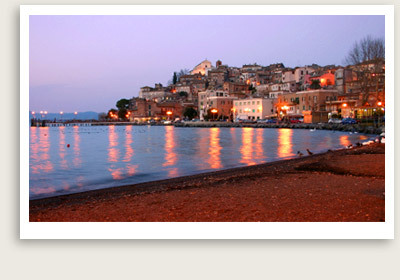 Let Well Arranged Travel take you on a private tour to Lake Bracciano and a visit to the famous Orsini castle. This private tour or day trip from Rome features the majestic castle and lake of Bracciano. After an hour’s drive from Rome, you will reach Bracciano, where you will visit the Orsini-Odescalchi Castle. The castle was built in the 15th century by the Orsini family, and passed on to the Odescalchis in 1696. The peculiarities of this site included its pentagonal boundary walls, and its manor–house with frescoes by Antoniazzo Romano and other Tuscan and Umbrian artists. The castle has gained modern notoriety as the locale for celebrity weddings like that of Tom Cruise and Katie Holmes. After your visit with the castle’s private tour guide, you will return to Rome along the town’s beautiful lake, where locals enjoy water sports and fishing.